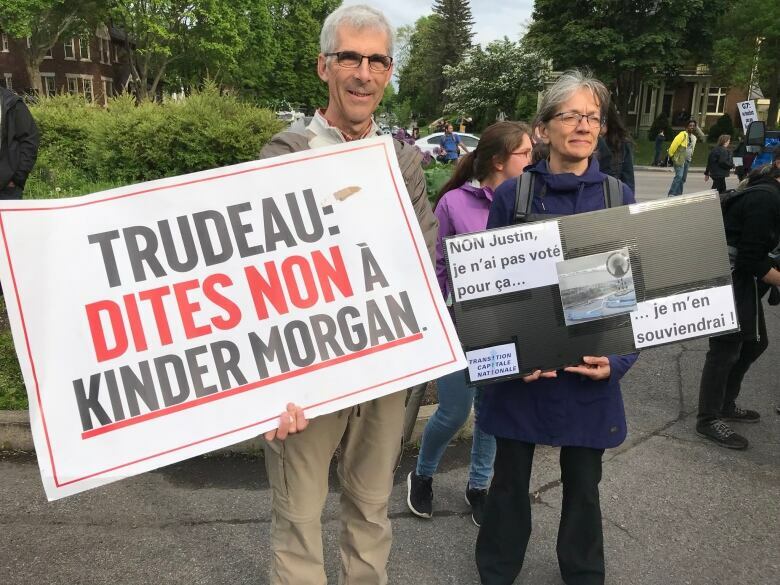 A small and mostly quiet march through Quebec City on Thursday evening kicked off a series of demonstrations opposing the upcoming meeting of G7 leaders in La Malbaie, Que. Around 500 people made their way from a park in the western part of the city to the downtown convention centre that is serving as a media centre for the summit. Along the route, demonstrators chanted anti-capitalist slogans and occasionally taunted the riot police who maintained a close presence throughout the march. Quebec City police said they arrested three people Thursday. CBC reporters also witnessed activists dressed in black threaten and harass several journalists covering the protest. Otherwise, the march unfolded peacefully, gathering a coalition of community, environment and Indigenous rights groups. Several of those present criticized Prime Minister Justin Trudeau's decision to nationalize the Trans Mountain pipeline in British Columbia. "This prime minister has handed us a bomb that is waiting to go off," said André Pikutelekan, an Innu from Pessamit, a five-hour drive northeast of Quebec City. "Despite his nice words, Justin Trudeau is denying our right to self-determination." Like other Innu members at the protest, Pikutelekan was dismayed that certain Indigenous leaders in Quebec opted to take part in the G7 summit. But the opposition to the pipeline expansion extended beyond the Innu community. Quebec City resident Michel Côté, who attended the demonstration with his wife, said he felt betrayed by Trudeau's decision. "We're taking this opportunity to tell Trudeau that his pipeline decision from last week, the one that's going to cost $4.5 billion, we didn't vote for that," said Côté, an environmental activist since 2009. The demonstrations, which are scheduled to continue early Friday morning, are taking place amid a huge security operation and much consternation among locals. They fear a repeat of the anti-globalization protests of 2001, which saw as many as 50,000 people in the city's streets, but also several million dollars worth of damages. Many business owners in Quebec City's historic quarter have boarded up their storefronts. Several downtown daycares and schools also shut for the day; public servants and elected officials were ordered to head home as of noon. Residents watched warily as the protest wounds its way to the convention centre, where it ended with a few flares being set off and a round of hacky sack. 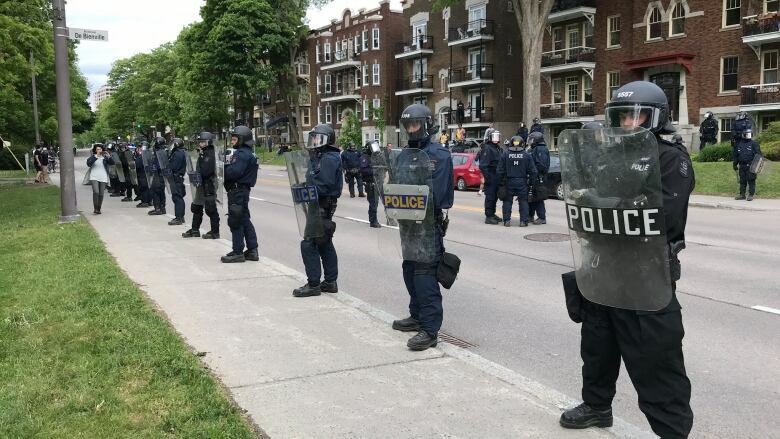 "A huge amount of money was spent to make sure there's a lot of security, a lot of police, and we are worried about the restrictions on the right to protest," said Alice-Anne Simard of the organization Eau Secours, one of the groups that organized Thursday's march. Earlier in the afternoon, a police operation took place in La Malbaie, about 140 kilometres from Quebec City, that forced the evacuation of a half dozen homes. Police searched a car amid concerns about the presence of inflammable material. But in the end, they said, nothing suspicious was found. "We're worried because we're told there will be no mass arrests, but the security measures put in place lead us to think there could be a discord between their message and what will happen on the ground," said Geneviève Paul, of Amnesty International, which is monitoring police response to the protests. Over the next two days, more than dozen groups will jostle for attention as they try to raise awareness about various social justice issues. On Thursday morning, Oxfam-Québec paraded giant puppets portraying the seven world leaders in an effort to raise awareness about women's economic empowerment. "We wanted to send a strong message to the G7 leaders that one neglected area has been unpaid care work," said Diana Sarosi, policy manager for Oxfam-Canada. According to the non-profit development agency, women devote two to ten times more time than men do to unpaid domestic work, from child care, to caring for elderly parents, to household chores. Despite the risk of trade talks on tariffs overshadowing the debate of other issues at the Summit, Sarosi said she was encouraged by Prime Minister Justin Trudeau's appointment of a gender equality advisory council got Canada's G7 presidency, calling the move "bold and ambitious". "These are powerful women from across the world who are not going to just walk away and say, 'It's over now,'" said Sarosi. Oxfam-Québec explained it wanted to get its message across before everyone else — and before any potentially explosive protests take over the news agenda. "We change hearts and minds, and the best way to do that is through peaceful protest," said Sarosi. CBC reporters will be on the ground in Quebec City and La Malbaie from Thursday to Sunday. Follow all the latest developments at cbc.ca/montreal, and on CBC Radio One and CBC Television. What's on Canada's agenda at the G7 — and will anyone want to talk about it?